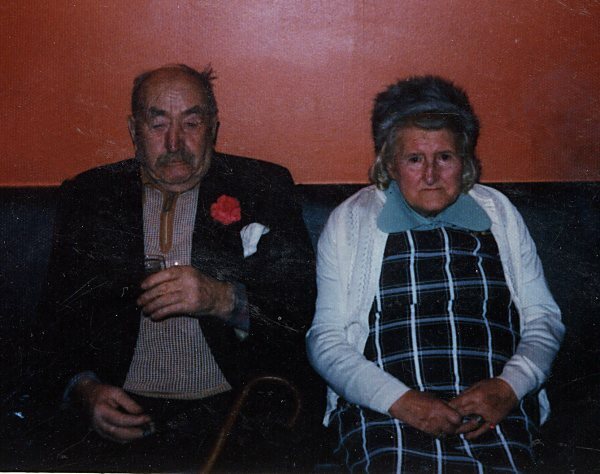 Cromarty Image Library - Jock and Kate Shepherd - c1975?? Jock and Kate Shepherd - c1975?? Jock and Kate (Catherine) Shepherd (nee Watson). Jock was born in 82 Church St, Cromarty in 1892. Kate was from St Martin's, Resolis, and born in 1896. My Granny used to call me Bottles, as I used to deliver her papers and she used to give me her empty lemonade bottles, which I used to take back to Mathesons and McEwans and get 5p per bottle. We lived next door to Jock and Kate in Bayview Crescent, before moving away in 1964. They were good neighbours to my mam and dad, Mina and Donnie. This is a nice pic of my granny and granda, i have my granda's birth certificate and it says he was born at 62 Church St, 1892 March 11th. He was registered March 26th so maybe there was a wee mix up - still a lovely pic of two amazing people! What a great photo. I must get one of my grandparents Andrew and Winnie Shepherd. Andrew and Jock are brothers you could hardly tell them apart they were so alike. My Dad and Jess are 1st cousins Jess is Jock's daughter you can tell where the family got their good looks from eh. Jess and Skip lived next door to my parents in Bayview Crescent you couldn't get better neighbours many a good laugh we had together round the fireside. My Dad would play his accordion and the mouth organ we would have a good old sing song and a wee dram. The local Bobby would often pop in for a cuppa (George Chalmers) was on the beat for a while. If only he knew what was in his tea, my mother always had a bottle of whisky to hand it's a good job he could handle his drink!.